26. I used to have a turtle named Sanora. She was named after the heroine of “Wild Hearts Can’t Be Broken;” the best movie on Earth with regards to diving horses during the great depression. Sanora died one winter because I forgot to change her heat lamp light-bulb. She died because I let her freeze to death. I’ve been thinking about getting another one. I feel responsible enough to keep it alive now. (It’s kind of amazing they let me take care of those aquariums). 27. I used to hate my moms chickens. When she would MAKE me go get their eggs or feed them when I was young, I would swear under my breath, “I will NEVER have chickens.” Since I’m older now and don’t have to take care of them, I’ve kind of grown fond of them… from a distance. The other day I found a whole new appreciation for them. They provide humor and lessons on human nature. As I walked past, I noticed they were all segregated by color. Apparently chickens are racist too. 28. I don’t communicate well on a phone. I think it’s because I rely too heavily on body language and non-verbal cues. All of my jokes come off flat. I take everyone else’s jokes too literally and end up looking air-headed and gullible. My voice sounds like a man. 29. I love flowers. They’re just so frivolous. You buy/grow/pick them knowing that all you will get to do is give them a few long glances and occasionally smell them. You don’t really touch them, you don’t hear them, and you know they will die after a few days; frivolous and luxurious. Winslow Homer: To me, his paintings express raw emotion. When I look at “Snap the Whip,” my arms ache. 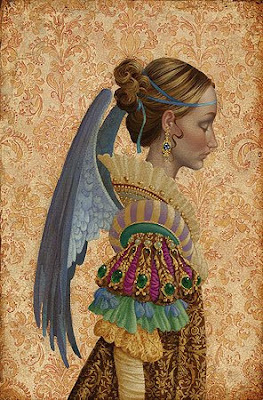 James Christensen: His paintings allow me to substitute my own symbolism, and he uses my favorite colors. Normon Rockwell: He makes me nostalgic for a time I never lived in and memories I don’t have. 31. My ears aren’t even. The ladies that adjust your glasses at the optometrist get frustrated trying to compensate for my lopsided ears. 32. When I was little I used to dream of one day getting my own secretary desk. I’m not sure where the obsession came from, but I would go get the newspaper every day and look through the classifieds for a secretary desk for sale. I would lay awake at night and just dream about how I would organize my office supplies (that I didn’t have) in my new desk. My secretary desk needed to have a drawer for hanging folders for my files and “stuff,” a cork-board back for my notes and “stuff,” and I would need a stapler so I could staple all my files, notes, and “stuff.” I’m not sure if this is revelatory of my love of office supplies or my love for organizing. 33. I love Clorox. I love the smell, the whitening effect, and the peace of mind that I just killed some germs. 34. I wish it was still commonplace to use phrases like: “shiver me timbers,” “two shakes of a lamb’s tail,” “the cat’s pajamas,” “the bee’s knees, “I’ll be a monkey’s uncle,” “silk purse from a sow’s ear” and basically any other phrase that talks awkwardly about animals. Luckily I still hear the good ol’ “see you later alligator” every so often. 35. I don’t mind killing spiders and bugs, but I don’t really like the feeling of its guts popping out between the Kleenex. As much as I dislike it, I wonder how it feels to them. Just crawling along, suddenly engulfed in white tissue, then POP! Do they even feel the POP? I hope not. 36. I just bought a brand new car. I fully expected to have the gut-sick feeling of buyer’s remorse. I didn’t. I don’t. I’m pretty sure I never will. I love it, and come November I’ll be especially loving the heated seats. 37. My 5 year goal is to break the 1 language barrier. I think I’ll start with Spanish. I always need it at work, it’s Latin based, and I’ll finally know what people are saying about me when I stand in line at the grocery store. 38. I love overcast, rainy days… especially in the fall. It gives me a good excuse to stay inside, watch a movie, read a book, or sew something. I don’t even really know how to sew, but it always makes me want to sew. 39. From the age of 4-14 I always had a fort outside. Some of them were in trees, some were in old sheds, one was in an old metal grainery, one was in a huge hole in the dirt. Every summer my main plan was to find my fort location, then domesticate it. 40. I love movie soundtracks. I like that there are no words, so you get to whistle along. My favorites are Quigley Down Under, Man from Snowy River, The Last of the Mohicans, All the Pretty Horses (dumb movie), and Rob Roy. 41. I think one of the finest blessings of living in a developed country is the concept of a hot shower. Unless you’re last in line, you always have the luxury of a hot shower and all you have to do is want it and pay your electric bill. I don’t take this little miracle lightly. I embrace it and absolutely appreciate it. 42. I’m a slow reader and I was always the last person to finish taking a test. I’m NOT a slow thinker though. I AM NOT a slow thinker. I’m just thorough… and deep… very deep. 43. In seventh grade I got the hiccups for 48 minutes in English class. I would just about get rid of them, then someone would laugh, then I would laugh, then they would get even worse. They were lasting so long that I began to wonder of that rumor about the man the hiccupped for 8 years was really true. It was so fun and funny that I still hope I get another long hiccup-run in before I die. 44. When I go to work I always have a sick feeling in the pit of my stomach. I think it’s just the fear of the unknown. I don’t know what kind of a situation I’m coming on to. Once I arrive and get to work, the feeling leaves, and everything gets exciting. But the feeling is always back the next time. 46. I am easily nostalgic. 47. My favorite colors are green and blue. Maybe that’s why I like Earth so well. 48. After writing the past 47 “things” I think I can sympathize with a bad stand-up comedian. Since you’re all in cyber space, I’m not getting any feed back. I write something. You don’t say anything, so I write something else. The comedian tells a joke, no one laughs. He tells another joke. If this fear I’m having is actually a premonition, someone please throw me a GENTLE tomato and tell me to sit down. 49. My clothes are hung in the closet by color, and they follow the color wheel. Red-Orange-Yellow-Green-Blue-Purple. 50. I worked on becoming ambidextrous during nursing school while taking notes. I had to give up when I couldn’t read my notes… or keep up. I LOVE READING THESE. There is no tomato to be thrown, because I'm clapping and begging for more. I'm so glad there are 50 more to go. That is the funniest picture of the chickens. They are segregationists, aren't they? 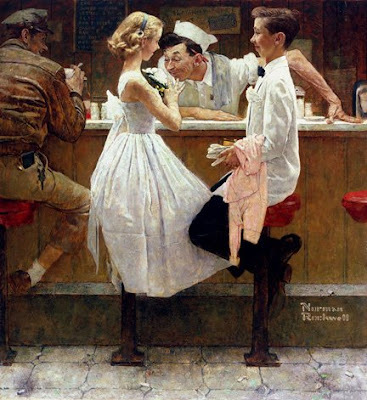 I also loved your pictures by your favorite artists and your comments about Norman Rockwell...so true, so true. Great list, Cali. Great list. Yes, this is good, too! You are making up for your looooonnnnggg absence, that's for sure. I love that your mom wouldn't use racist about the chickens and chose a very PC segregationist instead. 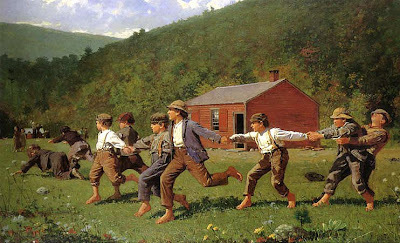 I love the Winslow Homer picture. Haven't seen it in a long time. I think I have a new appreciation for it, now that I have boys. I've been toying with the 1 language barrier as well. I'm still stuck on the dumb phrases you HAD to know in HS Spanish, like - Can I got to the bathroom, can I get a drink of water, will you buy me beer, and keep the change. Not very functional, especially since I don't like beer. Do you think the Rosetta Stone thing works?? Cal Pal, like Mom I love reading these! 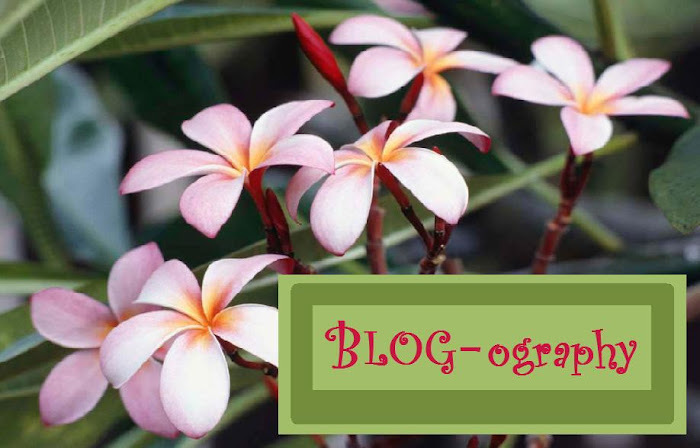 You pleasantly surprised me by having another post up today! kudos to you! I laughed many a times reading your blog. You make me laugh a lot. I think you are funny and I agree with you on most things. What a funny sister I have. (Aren't you glad I'm not saying "what a funny sister you have") I love you and your blog. okay, I was laughing sooo darn hard OUT LOUD!! good thing all the kids are gone to school, or they would have thought something was wrong and their mother was weird. I was laughing at you saying "I will NEVER have chickens!" We used to say daily "I will NEVER have pecan trees!" The daily picking up a 5 gallon bucket of pecans was pure torture! You do NOT sound like a MAN!! again, laughing really hard! I too love Norman Rockwell. He reminds me of a flood of memories of Grandpa and Granny Grunt. NO WAY!! I too have uneven ears! It was such a pain to get my glasses adjusted. I soon just resorted to getting LASIK and LOVE IT! 21 years of glasses down the hatch. I love TIDE the way you love Clorox. I love when I am out taking a walk and pass by a house and can smell that they are doing laundry.....so yummy! About peed my pannies reading the spider one. Your take on their thoughts right as they were about to be POPPED......priceless! I am the total opposite though, won't touch the gross things! What new car did you just buy? CONGRATS! Nothing smells like "new car", or drives like one. If you learn your language, don't come down here. You will NOT want to hear the things in the grocery store in "little Mexico". Do you really think people are saying things about you? Just how stinkin' beautiful you are and how pretty you smell. You are so funny! LOVE THE RAIN!! It is pouring here right now....LOVE IT!! okay, I just realized that I am writing a novel back to you. I will now stop! (even though I could comment on each of your "things") You have an incredible talent of writing....I could read all day long "the writings of Cali". Again, I have LOVED getting to know you more and more. Miss you guys! I would have absolutely never ever thought of arranging my clothes according to the color wheel. I tend to organize by the "this fits and that one doesn't" rule, with a little "I hate the shoes I have to wear with that" thrown in. So basically it's a "pending DI" sort of an arrangement. I wonder if your need to organize by the color wheel comes from smelling too much Clorox. And I wish you would come domesticate my "fort". I miss Rachel, who used to do this for me. I am fortly challenged, that's for sure. If it doesn't involve leaves and twigs then I'm in over my head. I love reading your blog because I get to wind through the synapses of your mind and watch it work. Amazing. You're truly amazing. I still don't think pictures have that much symbolism in them. I think we give way too much credit to artists and authors. I'm sure there's some in there, but I think we make up most of it.